Heat oven to 350ºF. Place paper baking cup in each of 24 regular-size muffin cups. Make and cool cupcakes as directed on box. Carefully pull back a small section of paper from each cupcake; insert large marshmallow between paper and cake of each. Frost tops of cupcakes and marshmallows to look like skull shape. 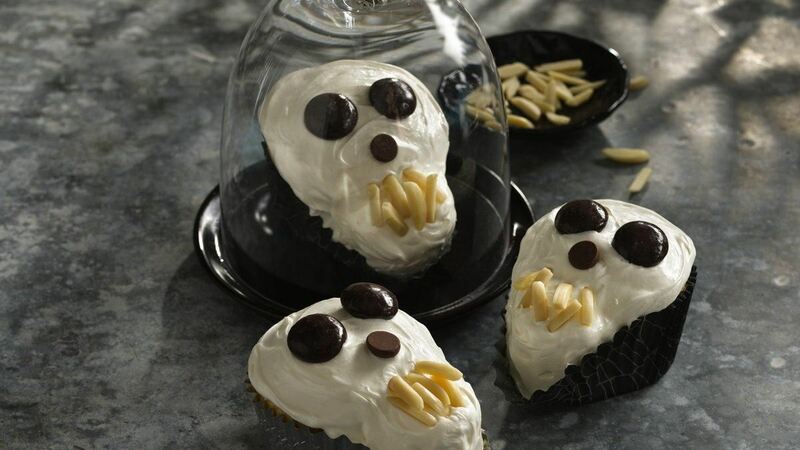 For each skull cake, use 2 mint candies for eyes, 1 chocolate chip, point side down, for nose, and 6 to 8 almonds for teeth. Store loosely covered. Tip: These cupcakes can be made several days ahead and frozen. You can freeze them before or after decorating. Tip: Look for Halloween-themed paper baking cups in the baking aisle at your local craft store.